I had this GREAT idea of having a St. Patrick's dessert party at work today. I was going to whip up all these desserts, decorate up the jury room like I've done for past St. Patrick's parties and invite all my co-workers. Well, here it is, March 13 and I haven't made any desserts. Why you ask? Two reasons. I've been waking up at 3:00 a.m. WIDE awake and can't fall back to sleep so I'm super tired and I spent all day Saturday with a friend who really needed one. 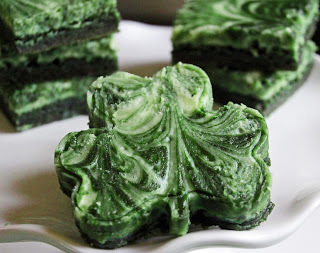 Green Velvet Cheesecake Swirled Shamrock Brownies from Life is Sweet. There's cream cheese in these brownies, need I say more? I didn't think so. 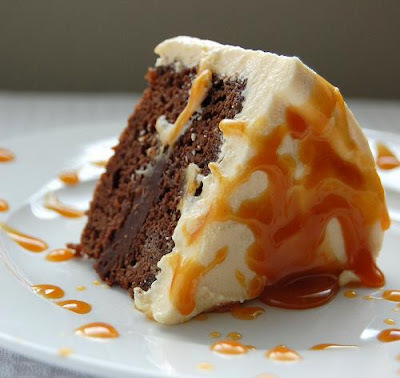 Bailey's Caramel Irish Cream Cake from Culinary Concoctions by Peabody. My husband says you could pour caramel over anything and I'd eat it. He may be on to something. I've always got Bailey's on hand too which makes this cake a must make. 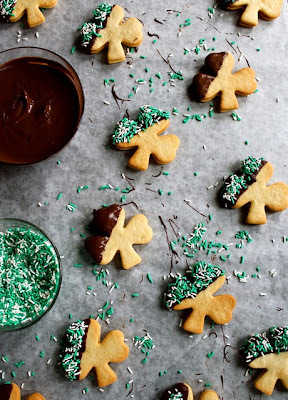 Bailey's Irish Cream Cookies by Buttercream Blondie . There's that Bailey's again :) How delicious do these look. All photo's from the blogs I've high-lighted. I've used they're amazing photo's so you'll click on the links to their blogs, spend a little time browsing on them and leaving them some bloggy love.